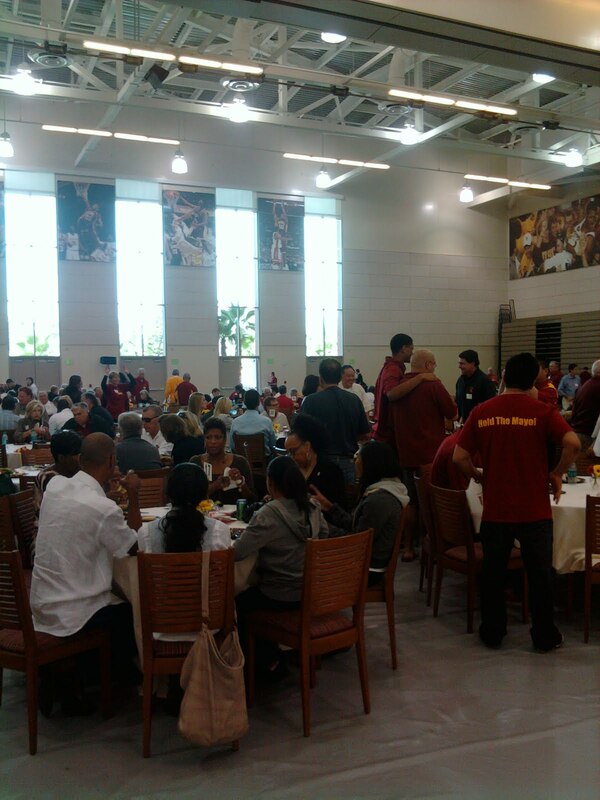 USC held their “Salute To Troy” basketball lunch at Galen Center today. This event featured both the women’s and men’s teams, and was held at the practice facility inside the arena. 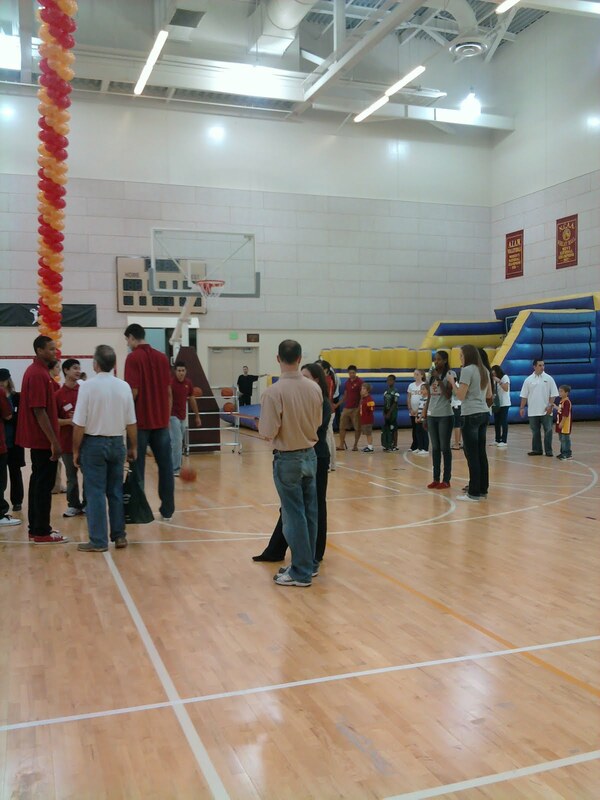 The facility has three full courts – one of which was available for both kids and adults to shoot. 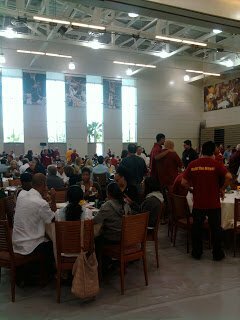 The other two courts were set up with tables for the buffet lunch that was served. They also had some souvenir giveaways, and the Trojan store had a table set up for shirts, hats and other items for purchase. I am guessing there were over 400 people there. Players from both teams mingled with fans, signed autographs and posed for pictures. New Athletic Director Pat Haden spoke, and everyone seemed to think he was a breath of fresh air and very positive person. He also had a funny side, joking with several former older Trojans including former Laker coach Bill Sharman. 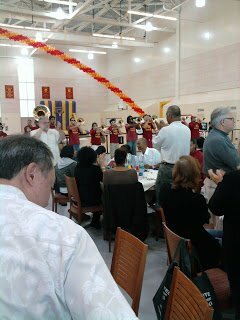 Members of the Trojan Band were on hand and played Fight On. Both teams were brought up on a stage, separately, and each player introduced themselves to the crowd. After that, women’s coach Michael Cooper asked for his three captains – Ashley Corral, Kari LaPlante, and Briana Gilbreath – to remain on the stage along with sophomore Chistina Marinacci and Freshman Cassie Harberts. They answered questions from one of the Trojans radio/tv announcers. I am not sure if Cooper was indicating that those five are his starters or he just wanted a mix from all classes. 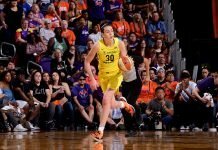 I spoke to Stefanie Gilbreath, and she is ready and eager to play after being injured for so long. Michelle Jenkins is hoping for a late December or early January return from her ACL rehab. All of the other girls seem to look healthy; at least no braces or casts were visible. I was able to chat with assistant coach Laura Beeman, who is very upbeat about the upcoming season. She is also very happy to be at USC. The team takes the stage. From left to right: C. Marinacci, M. Jenkins, M. Franco, J. Smith, V. Tagalicod, L. White, T. Southall, B. Gilbreath, C. Harberts, S. Gilbreath, K. LaPlante, A. Corral, J. Gemelos, and Coach M. Cooper. 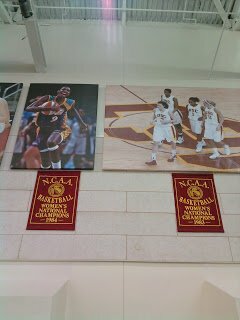 Missing was L. Brown a freshman PG. She had a class event conflict and did not attend the event. Fans line up to shoot at the foul line. Members of the Trojan band play for attendees. Fans fill up the tables. 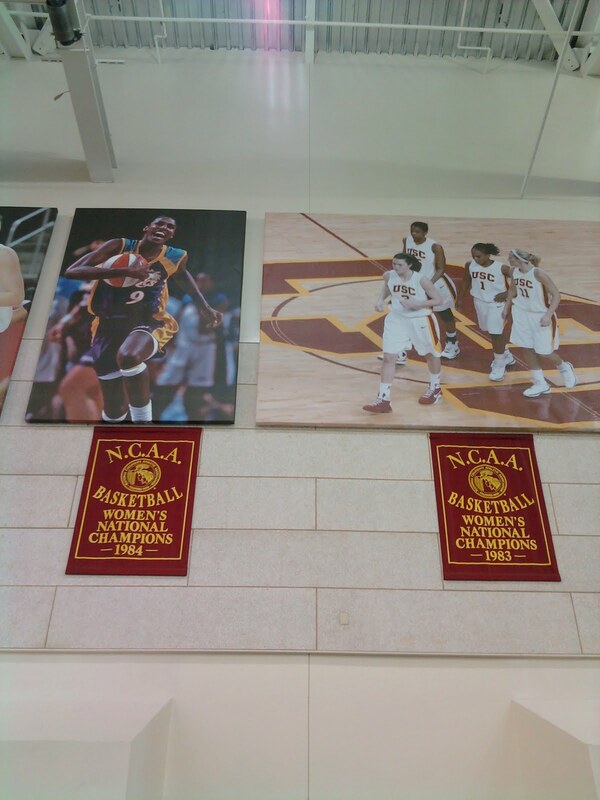 Pictures on the wall of the practice facility, including former Trojan Lisa Leslie (left).